Porter Creek has been voted BEST DINNER RESTAURANT for the 2nd year in a row! Thank you Burnsville for voting for us! 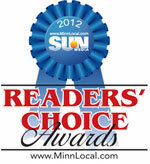 Readers Choice Award Winners are selected during a 6 week voting period by readers of Sun Newspapers and Sun Media. Click here to view Sun Newspaper “Best of the Best” publication.